I am thrilled to announce that my ten-minute play, Ready, Aim…Fire! 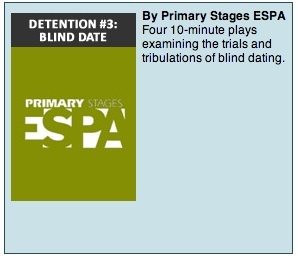 has now been published on Indie Theater Now as part of ESPA at Primary Stages’ Detention Series! This is my first published play – and my first comedy! – and I’m excited to share it with you all! Detention is a monthly series in which ESPA presents a writing prompt/challenge to its playwriting students. With less than two weeks to write, the plays are then selected for a one-night only, barebones production, directed by and starring ESPA students, at Jimmy’s No. 43 in New York City. My Detention theme was “Blind Date” and I had a blast writing it and collaborating with my fellow students to put it up. The whole collaboration process did, in fact, feel like a blind date, so it was fitting! And be sure to browse around and check out the entire Detention Series Collection (the first 15 are up with more to come!). There are some amazingly talented playwrights included in that roster, and I’m both humbled and proud to be amongst them. And to read more about my Detention experience, click here. This entry was posted in updates and tagged news. Bookmark the permalink.